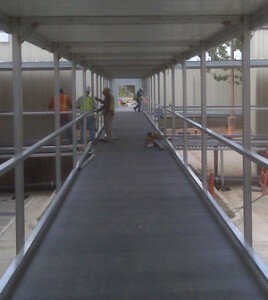 In the midst of construction of a new main facility, Brook Army Medical Center at Fort Sam Houston in San Antonio, Texas required a temporary elevated covered walkway for pedestrians to travel from temporary offices to the main offices. Mobile Walkways, Inc. installed such a walkway system for the Army’s largest military hospital and medical training facility using SAFPLANK®. Due to the requirement that this walkway be three feet off the ground, project engineers knew that traditional materials were too heavy and time consuming for this project. The engineers also needed a walkway that was strong, non-slip and easy to install. SAFPLANK® was the clear choice. The project utilized the medium grit 24” wide SAFPLANK® interlocking decking system. Its unique interlocking design allowed the installer to form a continuous solid walking surface. Strongwell’s SAFPLANK® impressed the customer because of the fiberglass decking’s light weight, durability and resistance to inclement weather. The ease of installation also led to an efficient assembly rate while maintaining reusability for later projects.